Enoxaparin sodium is a low molecular weight heparin marketed under the trade names Lovenox, Xaparin and Clexane, among others. It is an anticoagulant used to prevent deep vein thrombosis (DVT) or to treat acute deep vein thrombosis with or without pulmonary embolism (PE). It is given as an injection just under the skin or intravenously. Its use is evolving in acute coronary syndromes (ACS). 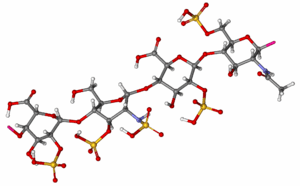 Enoxaparin is available from its originator as well as generic companies. Pregnant woman on enoxaparin should be monitored on a regular basis for bleeding and/or "excessive anticoagulation" especially when the delivery date is approaching. The risk of hemorrhage is higher during delivery if the person is still using enoxaparin and this could endanger the life of the baby and/or the mom. Enoxaparin binds to antithrombin (a circulating anticoagulant) to form a complex that irreversibly inactivates clotting factor Xa. It has less activity against factor IIa (thrombin) compared to unfractionated heparin (UFH) due to its low molecular weight. ↑ Issa, Abdelfatah Abou; Simman, Richard (2015-03-18). "Lovenox Induced Tissue Necrosis, a Case Report and Literature Review". The Journal of the American College of Clinical Wound Specialists. 5 (3): 66–68. doi:10.1016/j.jccw.2015.03.001. ISSN 2213-5103. PMC 4495755 . PMID 26199895. 1 2 3 4 5 6 7 8 9 10 11 12 13 14 15 16 17 18 19 20 21 "Lovenox® (enoxaparin sodium injection) for subcutaneous and intravenous use Prescribing Information". products.sanofi.us. Retrieved 2015-11-03. ↑ Lee, Sinjin; Gibson, C. Michael (2007-05-01). "Enoxaparin in acute coronary syndromes". Expert Review of Cardiovascular Therapy. 5 (3): 387–399. doi:10.1586/14779072.5.3.387. ISSN 1744-8344. PMID 17489664. ↑ Mourier, Pierre A. J.; Agut, Christophe; Souaifi-Amara, Hajer; Herman, Fréderic; Viskov, Christian (2015-11-10). "Analytical and statistical comparability of generic enoxaparins from the US market with the originator product". Journal of Pharmaceutical and Biomedical Analysis. 115: 431–442. doi:10.1016/j.jpba.2015.07.038. ISSN 1873-264X. PMID 26280926. ↑ Gershanik, Juan; Boecler, Betty; Ensley, Harry; McCloskey, Sharon; George, William (1982-11-25). "The Gasping Syndrome and Benzyl Alcohol Poisoning". New England Journal of Medicine. 307 (22): 1384–1388. doi:10.1056/NEJM198211253072206. ISSN 0028-4793. PMID 7133084. ↑ "Reducing Thrombotic Complications in the Perioperative Setti... : Anesthesia & Analgesia" (PDF). LWW. Retrieved 2015-11-05. 1 2 3 4 5 6 7 8 9 10 "DailyMed - ENOXAPARIN SODIUM- enoxaparin sodium injection". dailymed.nlm.nih.gov. Retrieved 2015-11-05. 1 2 Research, Center for Drug Evaluation and. "Drug Safety and Availability - FDA Drug Safety Communication: Updated recommendations to decrease risk of spinal column bleeding and paralysis in patients on low molecular weight heparins". www.fda.gov. Retrieved 2015-11-05. ↑ Commissioner, Office of the. "Safety Information - Lovenox (enoxaparin sodium) injection". www.fda.gov. Retrieved 2015-11-05. ↑ Alldredge, Brian; Corelli, Robin; Ernst, Michael; Guglielmo, B. Joseph; Jacobson, Pamela; Kradjan, Wayne; Williams, Bradley. Koda-Kimble and Young's Applied Therapeutics: The Clinical Use of Drugs (Tenth ed.). pp. 347–348. ISBN 1-60913-713-2. ↑ Trevor, Anthony J., Bertram G. Katzung, and Susan B. Masters. Basic & clinical pharmacology. McGraw-Hill Medical, 2012. ↑ "LowMolecularWeightHeparins". livertox.nih.gov. Retrieved 2015-11-05.